Stewart's vocal performance is impressive. The sound of her voice is gentle, elegant and sensitive, of a pure clarity and naturalness, yet powerful, dynamic and expressive with an unmistakably warm timbre. Andrico's delicate lute-playing not only supports the vocal performance, but merges with it into a virtuoso rhythmic unity. Mignarda give their music a soul. It's artists like these who will go down in history as masters of their craft. Mignarda make the song wistful and reflective...turning a piece so familiar it's almost hackwork into something of heart-stopping beauty. Ron Andrico's playing is superb, with a real understanding of pulse and tempo: when he plays a galliard or an almain you can dance the steps to it. Stewart...is simply astonishing. Conversational, dramatic, or elegiac as the lyrics dictate, never out of balance with her accompanist, she decorates and varies as naturally as a sean nos singer, with perfect diction and a real concern to communicate the meaning of the words. ...The whole thing is beautifully performed. Andrico faultless on his lutes...Stewart with beautifully judged, slightly understated expression. The recording is superb, every note perfectly clear, no extraneous noise from the fingerboard, and the balance between voice and lute perfect. My lute disk of the year so far. Laden with elegance...an adventure in sound made all the more bewitching through the talents of Renaissance past-master Andrico and enchantress Stewart. The Renaissance harmonies take on a surprisingly modern feel in Stewart’s rendition of the epic ballad of Helen of Troy from Horestes…[the] languid Willow Song, Desdemona’s famous lament from Othello, pulls at the heart strings -- as it surely was intended to do centuries ago. Essential listening for any lute player interested in the late 15th/ early 16th century repertoire. Donna Stewart sings these superbly, expertly negotiating the technical difficulties and bringing to life their refined but passionate emotion. Ron Andrico's lute gently interweaves the lower voices of the chansons. This involves some quite dextrous playing, but it always supports and never overwhelms the vocal part. Stewart's ornamentation of the vocal line in Victoria's Ne timeas, Maria is exquisite and her interpretation of Tromboncino brings out the intensity of religious devotion, but also subdued passion inherent in Petrarch's poetry. The performances are flawless with such perfect clarity of diction that reference to any liner notes is superfluous. As we have come to expect, Stewart and Andrico are marvelous as a team, delivering evocative and highly nuanced performances of well-chosen repertory. Anyone who has any doubts about the successfulness of arranging polyphony for a single voice and plucked instrument will be convinced from the opening track of this album. Donna Stewart is a mezzo with a clear yet rich voice that injects life and appeal into the most doleful pieces of Dowland. Sadness becomes meditation in her skillful tones. The lute, too, is a calming, reflective instrument, easily tinged with melancholy. Ron Andrico’s strong and sensitive performance brings out these qualities, while articulating the structure and tempo of the pieces with fine determination. 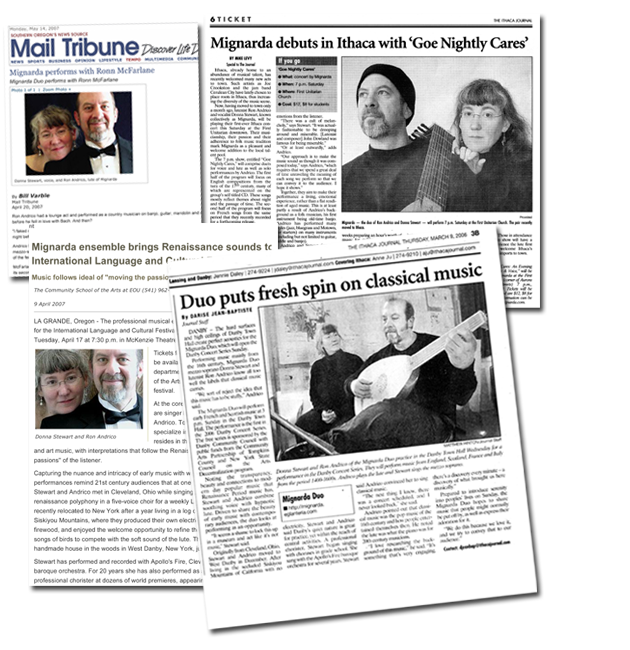 Mignarda, based in rural upstate New York, is available for concerts, house concerts, lecture-recitals, or in a format tailored to meet your needs. Please contact us for details & terms. "I believe that you and Donna form the pre-eminent lute song duo of our time. Please keep up the good work!" "I think that you must know, as music historians, that in the renaissance certain exceptional musicians were dubbed as 'divine'. Very few were allowed that title as it was deemed that they channeled the very essence of the muse. I do believe that you qualify."